Promises that are promise broken, gazelle punishes rat for breaking his promise. 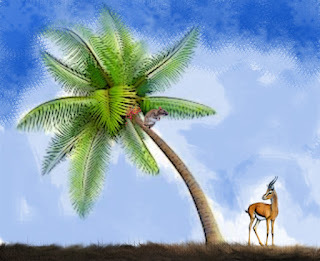 As the ancestors say, one day a Gazelle, being very hungry, went in search of food, and saw a fine bunch of palm-nuts hanging from a palm-tree; but having only hoofs he could not climb the tree. He therefore went in search of his friend the Rat, and said to him "I know where there is a fine bunch of palm-nuts, and if you will promise to give me some I will show you where it is." Gazelle punishes Rat for breaking his promise. The Rat readily promised to share the nuts. So together, they went to the forest, and the Gazelle pointed out the nuts to his friend. With his strong, sharp claws, the Rat quickly mounted the palm-tree, and found there three bunches of palm-nuts; but instead of cutting them down; he sat on a palm-frond and began to eat them. After a time the Gazelle shouted out, "Friend Rat, throw me down some of the nuts according to your promise." "Oh," cried the Rat, "when I am eating I am deaf, and cannot hear what is said to me" and he continued to munch away at the nuts. The Gazelle waited a little, and again called out, "Please throw me some of the palm-nuts, for I have hoofs, and cannot climb a tree like you." But the Rat ate greedily on, and took no notice of his friend's request, except to say that he was deaf when eating. Rat called out "Uncle Gazelle, put out your fire, the heat and smoke are choking me." "Oh," replied the Gazelle, "when I am warming myself by the fire I cannot hear what is said to me" and he heaped more firewood and dried grass on the fire. The Rat, choking with the smoke, lost his grip on the tree, and fell to the ground dead. The Gazelle returned to the town and took possession of all the goods belonging to the Rat. If you make a promise, keep it; and if you want a kindness shown to you, you must do kind things to others.